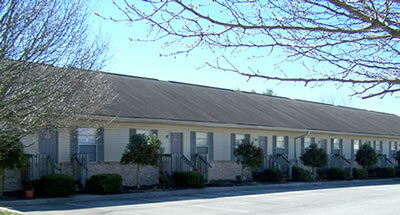 All our apartments are 2 Bedroom/1 Bath. They have an open floor plan with vaulted ceilings in the living room. The kitchen area is equipped with refrigerator, stove, dishwasher, and garbage diposal, and a laundry closet with washer and dryer connections is in the hallway leading to the bedrooms. Also, a privacy deck is located out the back entrance of each apartment. Our complex offers a outdoor swimming pool and a large common area adjacent to the Little Pigeon River. In addition, we have a clubhouse that is available to residents for gatherings and someone is available 24-hours a day to handle any emergency situation that may arise. Please feel free to contact us at 865-428-5186 or rcapts@rivercountryapt.com. Our office hours are Monday - Friday from 9am - 5pm and Saturday from 9am - 1pm. We do not currently have any available units at River Country. Please check back soon for future availability or call us at 865-428.5186.